Vintage Signed 8"x10" BxW photo by Haggard. 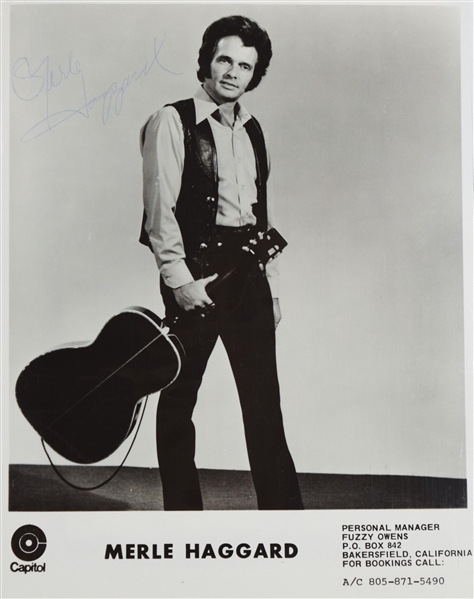 Merle Ronald Haggard (April 6, 1937 – April 6, 2016) was an American country singer, songwriter, guitarist, and fiddler. Along with Buck Owens, Haggard and his band the Strangers helped create the Bakersfield sound, which is characterized by the twang of Fender Telecaster and the unique mix with the traditional country steel guitar sound, new vocal harmony styles in which the words are minimal, and a rough edge not heard on the more polished Nashville sound recordings of the same era.